Snappis are another really great option to fasten a prefold. Made of a stretchy polyurethane, they have grippers similar to bandage closures (but bent back around, not poking down) which hold the prefold in place without pins. 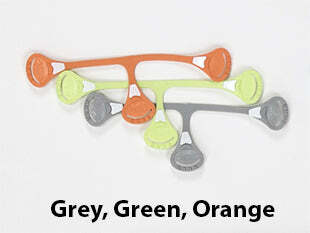 Size Toddler, Triple pack, for over age 3, only in grey, green orange. Usually Size 1 is the only size needed from birth to potty learning, but Size Toddler is also available for those who find they need it. Snappis are another really great option to fasten a prefold. Made of a stretchy polyurethane, they have grippers similar to ace bandage closures (but bent back around, not poking down) which hold the prefold in place without pins. I love these. Those moms who like these, really love them a lot! Give one a try. Fastening your prefolds saves you money. How? They help keep poop off the covers because they hold everything in place better than just laying prefold in a cover unfastened. When covers stay clean longer, you don't really need to buy quite so many. 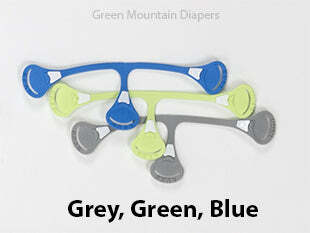 Many moms feel that everything works better when the prefold is fastened. Give it a try! Use with woven fabrics such as prefolds, birdseye flat diapers or muslin flats, but not knit fabrics. Because Snappis have 3 points to hold them, they stay in place and stay secure. You are supposed to use all three fastening points. Thus it makes sense to me (Karen) that the 3-point security of the Snappi is actually safer than other kinds of fasteners that we don't sell. Pinning still gets my vote as the best way to fasten a diaper, but I know not everyone likes to pin (I enjoy it!) so Snappis are the best alternative to pins. 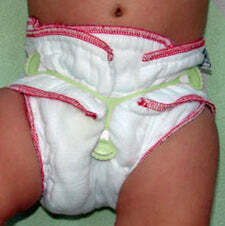 Always use a cover over it and do not allow baby to play with or pull at Snappis. CPSIA compliant. Made in South Africa. Keep Snappis out of the sun since they are not UV resistant. Replace Snappis if you notice wear or after 6 months of use. New Toddler Size. Most people won't need this size, but if it does become needed, it is nice to have this bigger size option. Available in Grey, Green, Orange only. Before first use, break in your Snappis. Stretch the Snappi® by holding it in the center with one hand and with your other hand, grab close to the end of one of the arms, avoiding the sharp teeth, and pull. Do not grab the Snappi by the loops. Repeat this about 10 times for each arm. You will notice the material begin to soften up and become more elastic. Once you do this for each arm your Snappi Diaper Fastener is ready for use! Holding the diaper in place with one hand, attach the Snappi® with the other hand in 3 simple easy steps: Hook Left, Hook Right, Hook Center. I love how easily a Snappi goes on, but it doesn't always stay put after my toddler runs around (he wears flat diapers). Having never used these before I was a little skeptical. After the first use though I loved them! Very easy to use and they do a great job holding the prefold. Just be aware they are pokey! Snappis are a must have if you’re using prefolds and a diaper cover. My old pairs have lasted 2 years of continual use and 6 mos on the second baby so definitely worth the money. Especially helpful to tired caretakers who are a little nervous using pins. These things are so easy to use! Much better than pins in my opinion. The thing I like the most is how easy they make the night time sleepy mama changes. 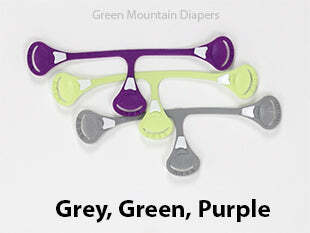 They also come in cute colors and are inexpensive and easy to replace.